Thanks to the magic of Twitter, I discovered that one of my sugar-driven idols, Bakerella, is the guest judge for this week's dessert photo challenge on I Heart Faces. Just the thought of one my pictures being seen by The Almighty (Cake) Popstar is making my palms all shweaty. Create an entry post. One photo. Contest ends @ 9pm CST. I'm late. I'm late. For a very important date. 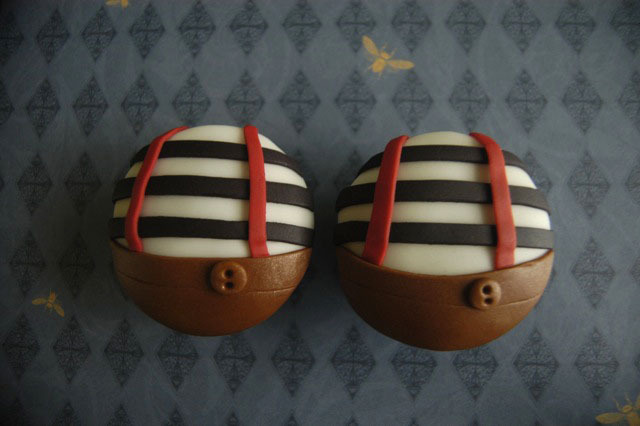 I decided to revisit the Tweedledee and Tweedledum cupcakes created for the Alice in Wonderland release weekend. Win or lose, they make me happy. Cravings still not satisfied? I Heart Faces can help you out. These are absolutely adorable. So clever! I just adore these - Total cuteness!! Thanks for sharing! Hope you are enjoying your week! these are too cute to eat!! well done!! Wow! True talent and creativity. So neat! Too cute! Oh they would have gone perfect with my daughter's merry un-birthday cake! Nice move, Ali! Good luck! Weee! That was the first post of yours I ever read! Ah nostalgia (from a few months ago?). Seriously though, those cupcakes was very impressive. Good luck! Oh MY those are cute! Oh my goodness. I don't know if bakerella will see these or not, but if she does, she is going to fall in LOVE! They are so adorable. Wow. just delightful as can be! So glad you learned of the contest and joined! Those are incredible! They were my favorite ones in the film. I think you can sell those on the street for like 50 bucks.